Jerusalem is considered one of the most ancient cities in the world. It was demolished and reconstructed more than eighteen times throughout history. It was established 5000 years BC by the Arab Jebusites who grow up in the heart of the Arabic peninsula. They moved with other Arabs, constructed Jerusalem and called it the city of peace. Historians believe that all the residents of Jerusalem shared a Canaanite origins and their mother tongue was the Canaanite language. After the Babylon conquest, Persian was added as an official language. In the beginning, Canaanite people were shepherds and when they settled afterwards in Palestine it was named after them Canaan. Historians were in consensus that the first monuments recognized in Palestine were theirs. They were the first Palestinian inhabitants after departing the Arab peninsula. 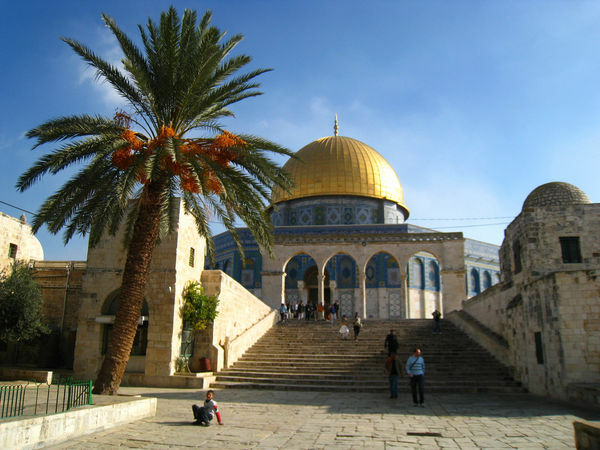 Al-Aqsa mosque is the oldest mosque inhabited for worshipping God alone after the sacred mosque. Therefore, all the Prophets visited the blessed mosque and offered their prayers there. Abdullah ibn ‘Umar may God be pleased with them both said: “The Prophets built and inhabited Bayt al-Maqdis and there isn’t an inch in Bait Al-Maqdis where a Prophet has not prayed or an Angel has not stood.” (Al-Anas al-Jaleel bi Tarikh al-Quds wa al-Khalil 1/239). When it comes to the issue of the construction of al-Aqsa Mosque, we would find it a matter which occupied the minds of both Muslim scholars and historians. There was a dispute over who founded its earliest construction, the first opinion is that Adam peace be upon him established the two mosques. This opinion was mentioned by the scholar Ibn al-Jawzy and Ibn Hajar the scholar of hadith in Fath supported this opinion. He attested to what Ibn Hisham mentioned in his book al-Teejan that when Adam built the Ka’baa, God commanded him to walk to Bayt al-Maqdis and to build it. So, he built it and worshipped God there. This opinion was confirmed-as said by the scholar in al-Fath- based on this, Adam is the one who established al-Aqsa mosque or one of his offspring because the interval of time between constructing the two mosques is only forty years, (Fath al-Bary 6/409). The second opinon is that Prophet Abraham peace be upon him is the one who established the mosque because this fact is well recognized by textual evidence of the Qur`an. If it is proved by textual evidence that he has built the Ka’baa, so building al-Aqsa mosque is preponderantly acceptable due to time convergence of both mosques. Among the supporters of that opinion Sheikh Ibn Taymia who said: “Prophets prayed in al-Aqsa mosque since the time of al-Khalil (Abraham).” (Majmou` al-Fatawa 27\258). In a different occasion he said: “al-Aqsa mosque exists since the time of Abraham peace be upon him.” (Majmou` al-Fatawa 27\251). Engineering specialized researchers confirmed the absolute similarity between the structures of the honorable ka’baa and the blessed Aqsa mosque. By using 3d engineering application and without taking into consideration the two different areas of the ka’ba and al-Aqsa mosque, by means of maps and photos, researchers clarified the superposition of the four angles of the two structures. This supports with more scientific evidences the assumption that Adam peace be upon him built both mosques and fixed their limits with inspiration from God the Almighty. [Bayt al-Maqdis studies magazine]. Changing the direction of prayer from al-Aqsa mosque to Ka’baa never affects the position of Jerusalem among Islamic sanctuaries and it is still the first of the two directions of prayer and the third holiest mosque to Muslims. The reward of a prayer in the Sacred Mosque (in Makkah) is worth 100,000 prayers, a prayer in Prophet’s mosque (in Medina) is worth 50,000 prayers and a prayer in al Aqsa Mosque (Jerusalem) is worth 50,000 prayers more than in any other mosque. The figures vary in traditions but it does signify the special status.